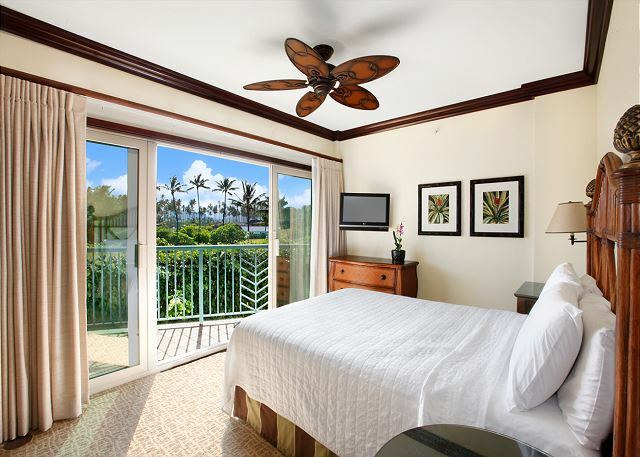 One of 6 corner executive suites, this second-story oceanfront location is spacious, luxurious and absolutely stunning! With northern views of 100 year old coconut groves and eastern views of the oceanic horizon, your surroundings are purely paradise. This suite was great for our party of 4 and very large. 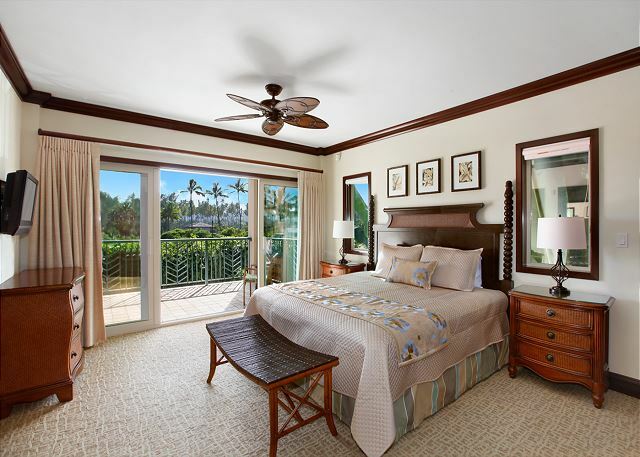 It has 2 beautiful bedrooms - the master suite is very large with shower, jetted tub and own lanai.There was no furniture on this small lanai - only complaint. The second bedroom is smaller with its own bathroom and shower. 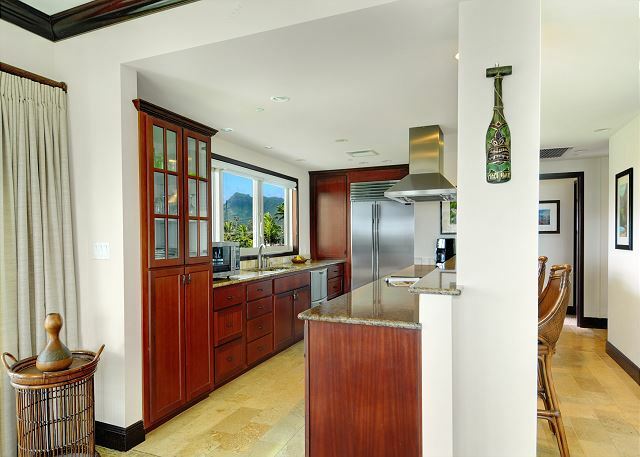 The kitchen has high end appliances, very modern and new and lots of amenities and storage. 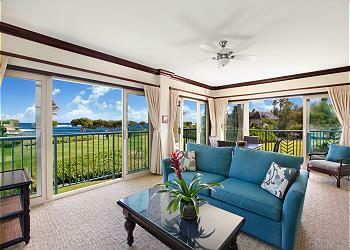 The main lanai had 2 loungers and a 6 seated large table. Great for big groups. The living room is spacious with amazing views of the ocean. 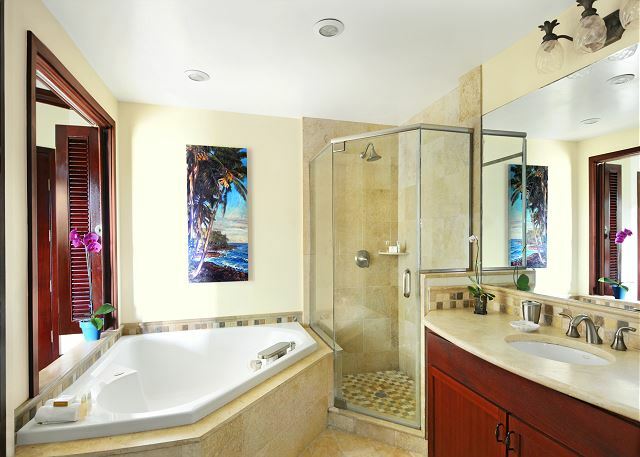 The property is clean and well maintained and pool area is beautiful. The pool is chest height for most adults and heated. There are a few hot tubs with sand bottoms which is different but great. 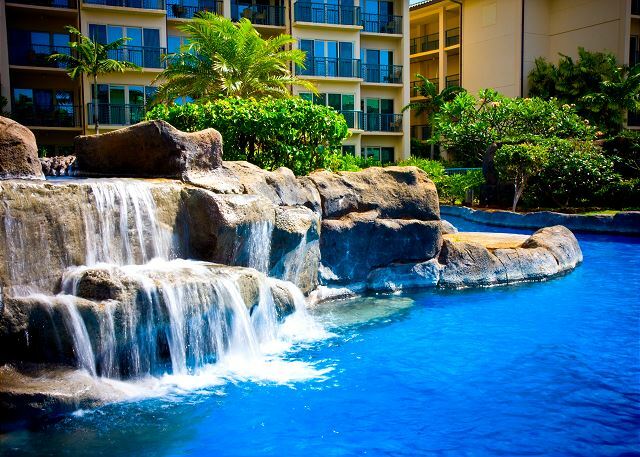 A few waterfalls in the lazy river to cool off. We used the BBQ's a few times. Everything was cleaned and worked great. They can get busy as there are only 4 of them for the entire complex. This area is very central to both the South side(25 min)and North side (40 min) and lots of great restaurants in the area as well. The app that we were provided from Rental Host was very easy to use and had all the info we needed. Communication before, during and after the trip was excellent. The only recommendation I would make is to shorten the code to get into the pool area. Having to remember and type in a 11 digit code is a bit much. I heard others commenting about it when we entered and exited as well.... Very minor issue though. Highly recommend this location and Resort ! Unit G201 is a beautiful condo. Spacious and well appointed. Great views from the large deck. Convenient to all resort activities. We did have a few issues with things in the condo, but the rental and resort maintenance teams responded effeciently and in a timely manner. We had a wonderful stay. The management group was friendly and always quick to respond. We will be back! This rental was perfect for two couples it has three full size bathrooms, an amazing view and a great kitchen. 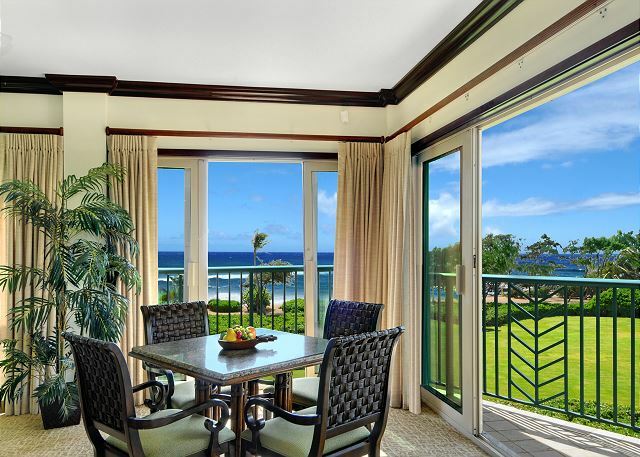 Just steps from the ocean and you can hear the waves from the sitting area and dining areas. A huge lanai!We made a great choice. Comfortable, had everything we needed. Picked this site for the view initially, but we now love this room and will likely have difficulty staying anywhere else in the future. Owners were available for all questions, and are super friendly. This is a beautiful property. We always stay in houses, villas, condos, flats (London) when we travel for more than a week. Most of them are as nice as they look, but most of them don't supply what this rental does. I've taken to bringing even my own salt and pepper because most places give you nothing. This rental had spices, olive oil and a couple of other cooking items. They had dishwashing detergent and dishwasher pods. There was a scrubber sponge and paper towels, saran wrap and tin foil. Each bathroom (there were three) had starters of shampoo, conditioner, lotion and soap. All the rooms had ceiling fans. And central air. There were three Samsung flat screen TVs. We only turned on the one in the living room, but it had Spectrum Cable and Netflix. There is no DVD player, however there is so much on cable and Netflix we never missed it. 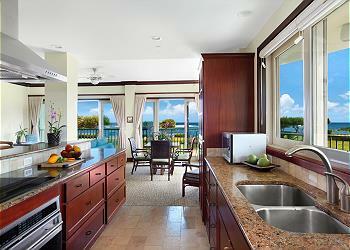 The appliances are top rate - enormous LG washer and dryer, Wolf oven, Magic Chef microwave. The coffee pot was a 12 cup Mr. Coffee. We're used to a Keurig so there was an adjustment there. I don't remember the dishwasher brand but it worked. The rain shower in the hall bathroom was fantastic. There were a couple of small things we needed to get fixed during our stay and management quickly responded. We were happy with the location - just outside Kapaa and across the street (literally) from the Safeway shopping center (with crazy high prices). We stayed right after hurricane Lane and there were no resort issues at all. Actually we never had any issues from the hurricane anywhere on Kauai. The bottom line is, the owners didn't buy a property and put as little into it as possible and try to rent it for a large amount. This is a really top grade property. We arrived in the evening so the coded entrance was very welcome. The unit was all that we had hoped and expected. We experienced two small problems while there. The shower drained slowly and cable tv was horrible. I believe that shower problem had not been reported previously because it was repaired the same day that I reported it. The cable problem appeared to be resort wide but was not that big of a deal to us because we did not go there to watch tv. Internet service was great so we could get news and mail etc. 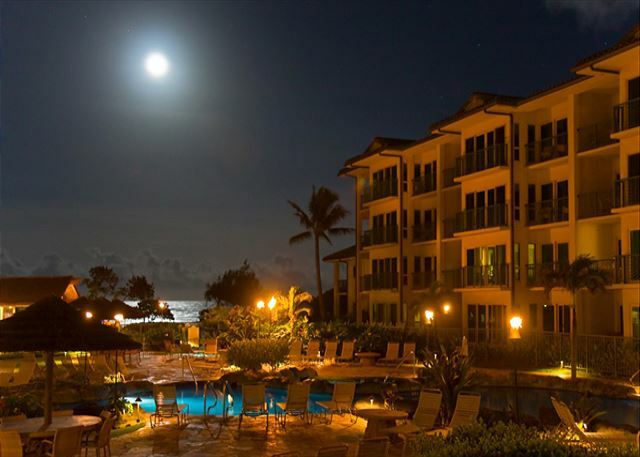 I highly recommend Kauai Exclusive Management and would not hesitate to use them again! Had a great stay and really, REALLY enjoyed room G201. Room layout was spacious, location was great being on the end of the unit and close to a stairwell that goes pretty directly to the parking lot. Building has its own elevator, and G is very close to the pool gate entry and wristband/towel shack. We loved it, will try to rent the same unit again in the future! Wonderful condo, beautiful view. Would stay here again for sure. The space was comfortable with a nice kitchen with all the necessary elements provided. Beds were extremely comfortable. Beach chairs and some other assorted accessories were in the unit and we made use of them during our stay. Had no problems accessing the unit, property or amenities, unfortunately due to weather we ended up spending most our time off-site in order to take advantage of the limited sunshine. Nice stay at G201 - Great property management! Talk about a large condo! The master bedroom was located in the back of the condo, which was so quiet. The kitchen had ALL brand new utensils for cooking. We had to call about the safe in the bedroom, and management company was quick to respond. Very professional, and nice to work with. We were nervous about a comment we read on earlier post about the view of a parking lot, and there is a lot on the side of the bldg., however, there were no cars there, and NO issues. 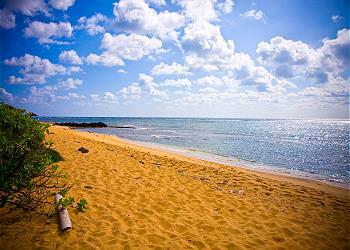 My husband and I sat out on the lanai every morning and had our coffee, looking at the ocean. The views from the living room and dining area are breathless. You open the sliders and can hear the ocean waves. We would stay here again and appreciated all the amenities, esp the washer and dryer IN the unit! They even provided soap to do laundry! This is a large, roomy condo. There was 5 of us, and I felt there was plenty of room. Note, we went to Kuhio Shores the following week, and even though we were right on the beach, perfect view, the condo was way too cramped for us after staying at G201. Thanks again for keeping the condo clean and very well stocked. Awesome property and the unit was exactly as described. The only negatives were the pool security is ridiculously overdone and the beach out front is not great. Condo G201 is a beautiful condo and the location is excellent with an ocean view. Very quiet location and well kept property. What a great condo! We started off with a just a couple of gliches with the property, but the management company was awesome and fixed most of them. We loved the place, the view, the amenities, and we would rent here again and again!! It was very clean too, which was very important to me. Just as described and maybe better! All the furniture is clean and comfortable. The bedding is new/newer and very comfortable as well. Kitchen is well stocked. Kauai Management was a dream to work with. Broken dishwasher was replaced the same day! Close to everything, pool was to die for and had something for everyone. A child sand beach/pool and kiddo only hot tub was perfect so those of us with no little ones had two sand bottom hot tubs of our own. Two water slides, and a lazy river style pool with waterfalls. BBQ area, bar and grill next to pool! Across the street and next to McDonald's was a restaurant called Home Cooking, it is a MUST if you want to enjoy "local food" at an affordable price. 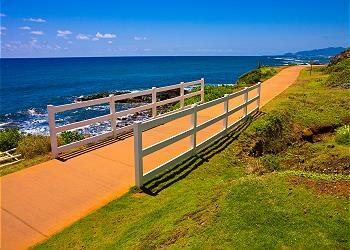 We live on Oahu part of the year and had not visited Kauai in a long while. We will be back very soon and will be disappointed if this unit is already booked!